"just to see what they have" by way of fall decor. Since I already have my budget I knew it wouldn't break my bank if I tucked in there right quick and checked out the goods. So many goodies for such a low price! I ended up just grabbing one item ( I needed a new diffuser and oil for downstairs) and headed to the checkout. The couple in front of me was quickly wrapping up their purchase but were short .09 cents. I offered them a dime. It was no big thing to me as I had a bunch of change in my wallet and it just didnt make sense to me to waste the $5 bill they had just given the cashier. The couple thanked me profusely and went on their way. Unfortunately for me, the grocery store I went to was next to Michael's. So I popped in there before getting my grocery on and was super excited when I discovered they still had the vinyl wall quote I wanted for the kitchen! It was $19.99 and had already been configured into my fall budget so getting it wasn't a big decision. Not too mention they only had ONE left!!! I go up to the register, and the cashier rings me up. $20.86. As I open my wallet, the lady behind me reaches into her purse and says "here, I have an extra 50% off coupon". Sure thing she replied, I have another. My total changed to $10.86. So this woman, whoever you are, THANK YOU!!!! It was such a lovely moment that I had to post to FB and share my happiness! Ahhh the kindness of strangers!!! It just goes to show that you never know how your actions will affect others and come back to you as a blessing! 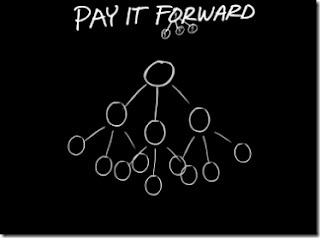 So Pay it Forward people!!!! And see it work in your life!!!! Thanks for joining in for Coffee on my blog! You've got a great blog over here! I look forward to more visits.